Warehouse workers cant rely on instinct when it comes to lifting properly. If they dont stop and think before they grab a heavy crate or unwieldy piece of plywood, they can get seriously hurt. In fact, eight out of 10 people will end up suffering some kind of back injury in their lifetimes. But much of this can be prevented with the use of specific lifting techniques that maintain proper alignment and support the back throughout the lifting process. 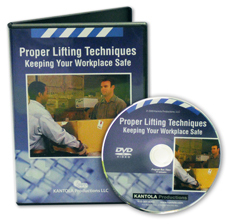 Proper Lifting Techniques was designed to help you reduce lost-time accidents due to improper lifting. Learn basic safe lifting techniques. How to lift awkward objects. Proper Lifting Techniques is guaranteed. We want you to use this valuable resource and put its safety information to work in your department. Then, if you are not 100% satisfied, you may return it within 30 days for a full refund.